More than just a utilitarian fixture, the sink is part of what gives your kitchen its character. How your sink is mounted might seem like a minor detail, but it can affect both the aesthetics and the usability of your kitchen. Whether an undermount or a drop-in sink is right for you depends on the look you want to create, your countertop material, and your budget. An undermount sink is installed with the sink’s top edge below the countertop, so no rim shows above. The result is an unbroken visual flow across the countertop, a modern appearance, and a little extra space. Streamlined look – An undermount sink offers a clean, minimalist look that’s perfect for contemporary design styles. The visual continuity complements the high-end feel of luxury countertops, such as granite and marble. This effect is even stronger if you choose a sink in the same material as your countertop. Even some more traditional kitchen styles look better with an undermount sink. An undermount apron sink is right at home in a classic farmhouse kitchen. Because undermount sinks are associated with premium quality and designer forms, they can also give your home’s value a little boost. Easy to clean – With no rim between the counter and the sink, an undermount sink makes it easy to wipe crumbs straight into the sink. You won’t have to worry about gunk building up along the rim. That said, undermount sinks have a mounting point below the counter where debris can accumulate. Applying silicone caulk help keep this joint clean, but you’ll need to replace the caulk every few years. There’s also some risk that your countertop edges will become chipped without a sink rim to protect them. More high quality options – Because undermount sinks are usually designed for high-end kitchens, they’re more often made with high quality material and closer attention to detail. You can find them in copper, granite, fireclay, and other appealing, durable materials more easily than drop-in models. A little extra space – Without a sink rim, you’ll have a few inches of extra counter space. It might not be much, but it’s handy if you want space at the back of the sink for storing dish soap and brushes. 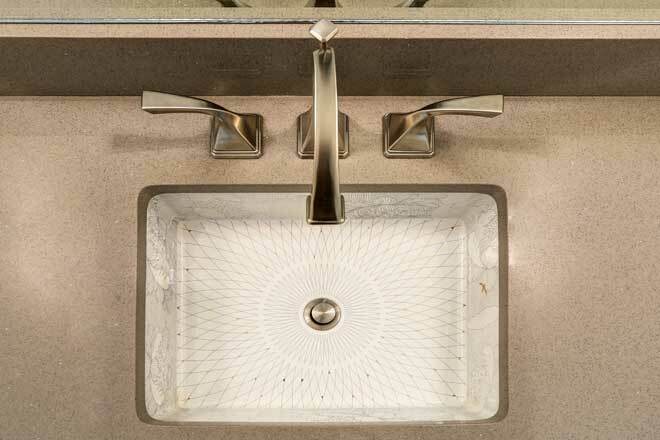 Undermount sinks also typically have a deeper basin than drop-in models, partly to counteract the lack of rim. A deep basin lets you fill the sink with enough water for washing dishes and other tasks without having the water level so high you’ll splash the countertop. 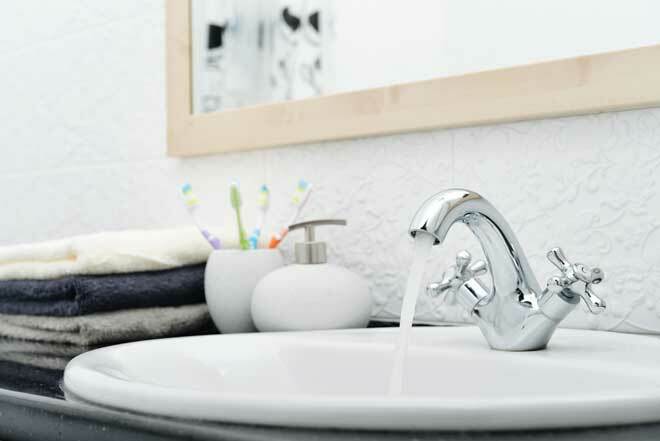 Higher costs – With the higher quality of undermount sinks comes a higher price. These sinks often cost 50 to 100 percent more than drop-in models. Not only is the sink itself more expensive, but your installation costs will also be higher. More complicated to install – The first issue with undermount sink installation is the fact that they can’t be installed on laminate or tile countertops. These materials can’t support the weight of the sink. Instead, you’ll need a countertop made of stone, solid surface (acrylic composite) or similarly strong material. Pairing this sink with stainless steel, copper or wood butcher block counters is sometimes possible, but not always. The second concern is that professional installation is usually a must for undermount sinks because space for the faucet and knobs needs to be cut into the countertop or wall. If you’re having new countertops put in, a hole for the sink is usually included. For an undermount sink, the hole must be exactly the right size, so discuss this with your contractor beforehand. This sizing issue also poses a problem if you’re planning to switch from a drop-in sink to an undermount model. The most common type of sink, drop-in sinks are supported by a rim that rests on the surface of the countertop. Thanks to this design feature, they’re also known as overmount, top mount, and lay-in sinks. This sink design has the advantage of being easy to find in a wide range of styles and simple to install. Traditional appearance – The drop-in sink is the style we’re most used to seeing, so it fits right in no matter what style of kitchen you have. If you’re designing a vintage kitchen, an overmount enameled cast iron, or porcelain sink will help complete the look. The only downside is that if you do have luxury countertops, you might not want the edges covered by a sink rim. More style options – The popularity of this sink design means it’s manufactured in a wider range of materials, styles, and colors than undermount models. If you want a cherry red sink to brighten up your kitchen, you’ll have better luck finding one in a drop-in design. Less expensive – Drop-in sinks are the more budget-friendly option and will typically cut at least $100 off your costs. Installation is simple enough that you can do it yourself if you’re handy with plumbing. If you choose professional installation, a drop-in model will be easier for the installer to work with, meaning you’ll pay less. Greater versatility – A drop-in sink can be installed in any type of countertop. Most drop-in sinks are designed for a standard-sized hole, but with those that aren’t you still have more flexibility than with an undermount sink. That makes it easier to replace your existing drop-in sink. 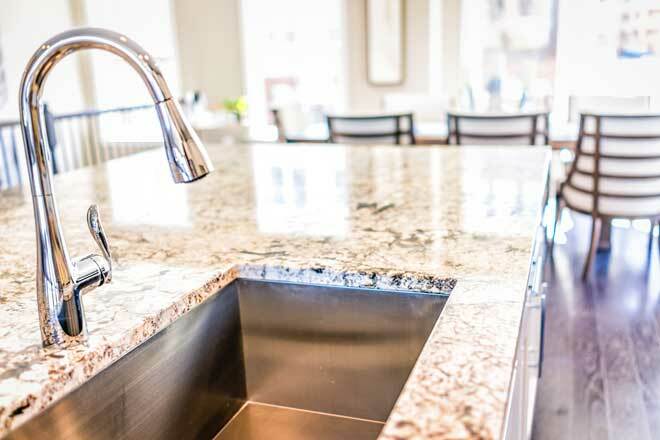 Cleaning and maintenance issues – The rim of a drop-in sink is prone to gathering food crumbs and makes it a little harder to clean your countertop. As with undermount models, caulking helps, but caulk can discolor well before it wears out. The sink rim is vulnerable to chipping and can end up looking unsightly. The choice between an undermount sink and a drop-in model is both a stylistic and a practical one. If you want a kitchen with an ambiance of luxury, an undermount sink is the way to go. Just make sure your countertop material is strong enough to handle one. If your budget is tight or you’re going for a vintage look, a drop-in sink will better suit your needs.